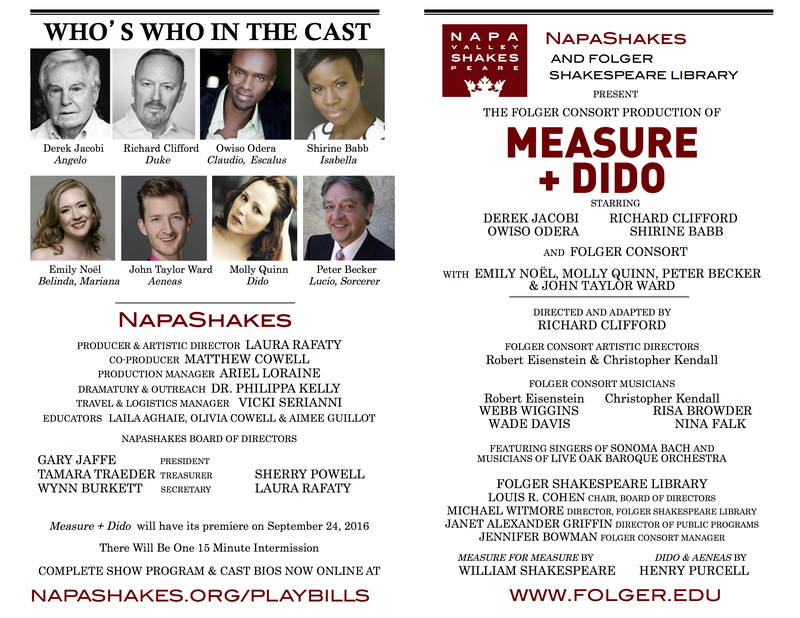 READ CAST & SHOW INFO FOR OUR CURRENT LIVE PERFORMANCES! Be Sure to Visit our Dedicated Live Performance Page to learn more about the production! Derek Jacobi is one of the world’s most respected and beloved theater and film actors. 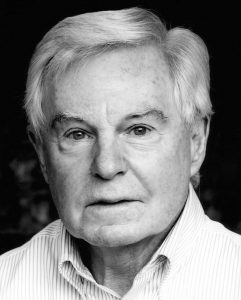 One of only two actors ever to receive two Knighthoods (along with Sir Lawrence Olivier) and celebrating nearly 60 years in the industry, Derek Jacobi’s many film, theater, and television credits are too numerous to mention. His role as the King in Cinderella was his fourth feature film collaboration with director Kenneth Branagh following Hamlet, Henry V, and Dead Again. He has starred in more than 50 feature films including: The King’s Speech; Ironclad; Hereafter; Anonymous; There be Dragons; A Bunch of Amateurs; Hippie Hippie Shake; The Golden Compass; Nanny McPhee; Gosford Park; Gladiator; Underworld: Evolution; Bye Bye Blackbird; Aladdin; Enigma; The Secret of Nimh; The Odessa File; The Day of the Jackal, and Othello. His extensive television work has garnered him Emmys, BAFTA, and Golden Globe nominations, including for his iconic role in I Claudius. He received Emmy Awards for NBC’s Frasier and for CBS’ The Tenth Man as well as a Golden Globe nomination; and BAFTA nominations for both the BBC’s Last Tango in Halifax and Breaking the Code. Other notable television roles include: Vicious with Ian McKellen; Titanic: Blood and Steel; The Borgias; Joe Maddison’s War; Margot; Endgame; Diamonds; The Old Curiosity Shop; The Long Firm; The Gathering Storm; Mr. Ambassador; Inquisition; The Jury; Jason and the Argonauts; Cadfael; Witness Against Hitler; Circle of Deceit; The Secret Garden, and Cyrano De Bergerac. Derek Jacobi’s career on the stage is without parallel. A master of Shakespeare, he has performed in nearly 80 notable theatrical productions including the role of Malvolio in Twelfth Night at the Wyndham’s Theatre, which in 2009 garnered him an Olivier Award as Best Actor. Other award-winning productions include: Much Ado About Nothing which garnered him both a Tony Award and London Critics Circle Theatre Award as Best Actor; Breaking the Code, for which he was nominated for a Tony Award; and Cyrano De Bergerac which garnered him a London Critics Circle Award as Best Actor. 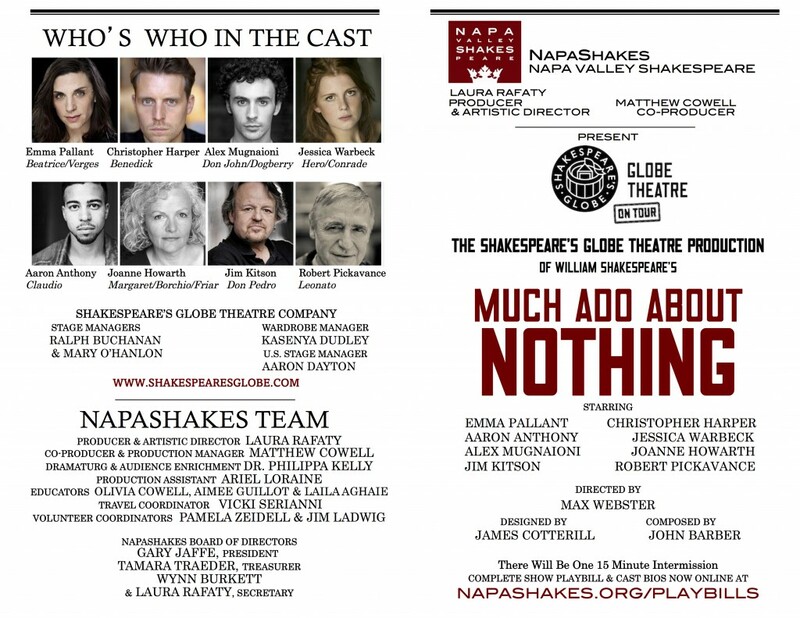 He recently played Mercutio in Branagh’s Romeo & Juliet at London’s Garrick Theatre to great acclaim. 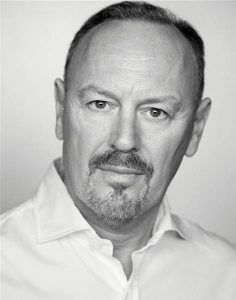 Richard Clifford is a celebrated actor and director both in the UK and the US. His recent direction of Schiller’s Mary Stuart for Folger Theatre, on stage through March 8, has been widely praised. 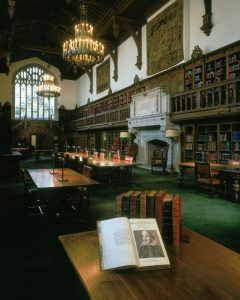 Previous productions with Folger Consort include The Tempest in 2010; Purcell’s The Fairy Queen with passages from A Midsummer Night’s Dream in 2007; and Milton’s Comus in 2001. He has directed numerous Folger Theatre productions–The School for Scandal, The Game of Love and Chance, The Clandestine Marriage, Elizabeth the Queen for which he won a Helen Hayes nomination, All’s Well That Ends Well, and She Stoops to Conquer. 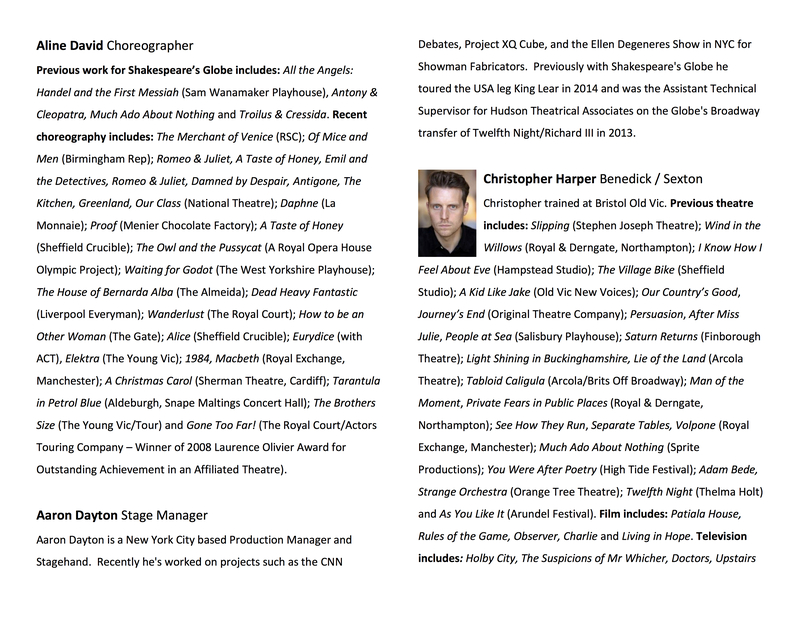 Other directing credits include The Mikado, The Pirates of Penzance, Die Fledermaus for Intermountain Opera in Bozeman, MT; Playing the Wife and Heartbreak House at England’s Chichester Festival Theatre; among others. As a stage actor, Mr. Clifford’s most recent credits include Amadeus at Chichester and Michael Grandage’s Henry V. Other credits include Ivanov, Twelfth Night, and Hamlet for Prospect Theatre at London’s Old Vic, as well as An Ideal Husband, Hedda Gabler, The Magistrate, She Stoops to Conquer, Love for Love, The Tempest, and The Apple Cart. For the Royal Shakespeare Company, he acted in both Cyrano de Bergerac and Much Ado About Nothing, which captivated Washington audiences when these productions toured to the Kennedy Center in 1985. 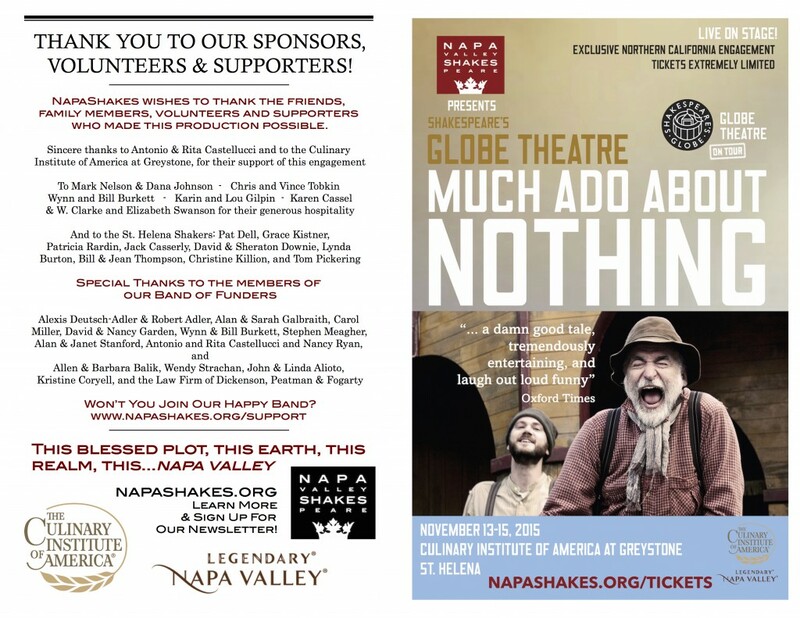 Mr. Clifford was part of the Renaissance Theatre Company and appeared in many of Kenneth Branagh’s films—Henry V, As You Like It, Love’s Labour’s Lost, and Frankenstein. Other work includes the films My Week with Marilyn, Carrington, The Fool, and Little Dorrit and television’s The Fortunes of War, Queen of Swords, The Tudors, among others. 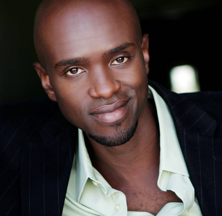 Owiso Odera: Born to Kenyan parents in Khartoum, Sudan and raised in Nairobi, Kenya, Owiso Odera is a Santa Monica-based actor.Off-Broadway Owiso recently starred in the world premiere of Katori Hall’s Our Lady of Kibeho at The Signature Theatre for which he was nominated for both the Lucille Lortel and AUDELCO awards for Outstanding Actor in a Leading Role. He has also appeared with Roundabout Theatre Company, the Public Theater, and The August Wilson American Century Cycle at The Greene Space/WNYC. Regional theater credits include: August Wilson’s The Piano Lesson (McCarter Theatre); August Wilson’s Two Trains Running (Two River Theater, Red Bank – NJ); August Wilson’s Gem of the Ocean (A.C.T, San Francisco); the world premiere of Matt Smart’s Samuel J. 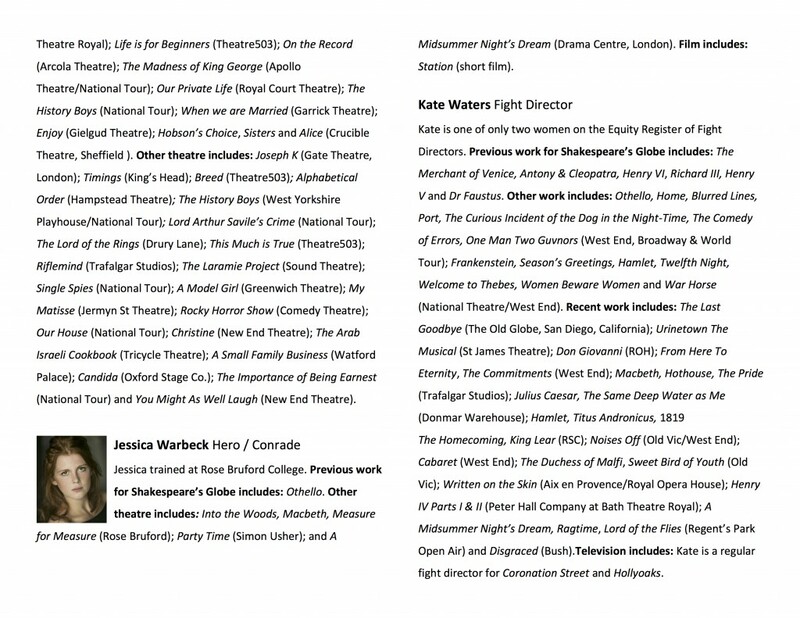 & K at the Williamstown Theatre Festival; the title role in Othello (The Folger Theater); Groundswell (The Old Globe); Love of Three Oranges (La Jolla Playhouse). 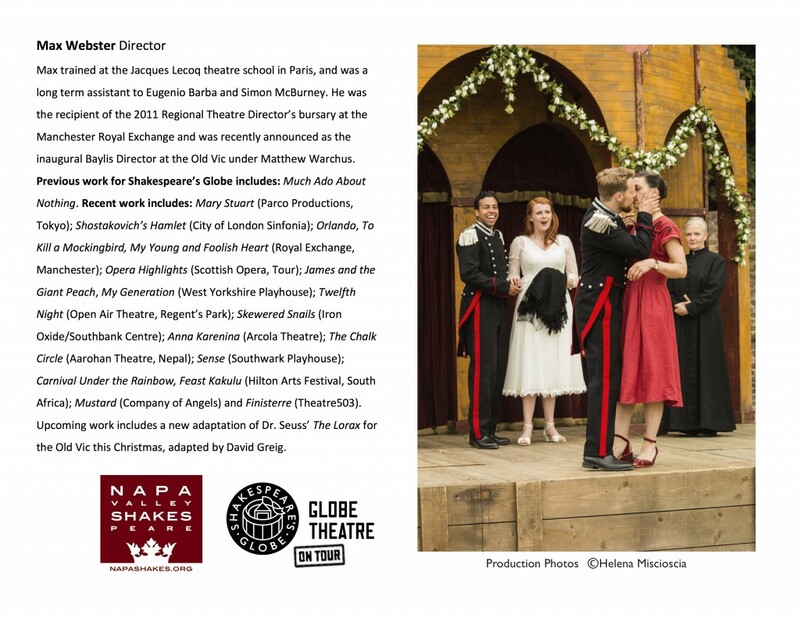 Owiso’s love for Shakespeare has been rewarded with roles in Titus Andronicus, Romeo & Juliet, A Midsummer Night’s Dream, Merry Wives of Windsor (all at The Old Globe, San Diego) and Macbeth (Commonwealth Shakespeare Company, Boston). Shirine Babb is a New York City-based actress. She last appeared at the Folger Theatre as Porcia in Julius Caesar and along with Derek Jacobi and Samantha Bond in Folger Consort’s The Merchant of Venice. She has appeared on Broadway in Macbeth with Lincoln Center Theater and Off-Broadway with The New Theatre at 45th Street, The Women’s Project, Pulse Ensemble Theatre, and Ensemble Studio Theatre. She has appeared at the Old Globe Theatre in San Diego and at the American Shakespeare Center in Twelfth Night and Measure for Measure. Other credits include The Tempest at Hartford Stage and Macbeth at the Long Wharf Theater. 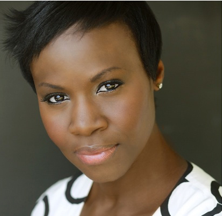 Her television credits include WE are NY, All My Children (ABC), Blue Bloods (CBS), and Madam Secretary (ABC). Celebrating 40 years as early music ensemble in residence at the Folger Shakespeare Library in Washington, DC, Folger Consort has delighted audiences with a stunning array of early music spanning roughly 600 years of repertoire. With a variety of world-class guest artists, from virtuoso soloists to large choirs and orchestras, Folger Consort has performed masterpieces from the most renowned composers to hidden treasures from those who might otherwise be lost to history. 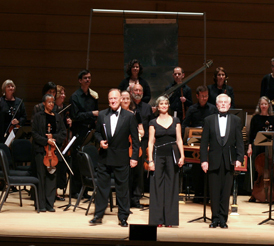 Folger Consort performs in the intimate setting of the Folger’s Elizabethan Theatre, as well as grand spaces such as Washington National Cathedral, The Kennedy Center, and Shakespeare’s Globe in London. With each season of early music, Folger Consort promises a new and “infinite variety” of inspired performances. Among other awards and critical acclaim for its performances and recordings, Folger Consort has received five awards for Best Classical Chamber Ensemble from the Washington Area Music Awards. 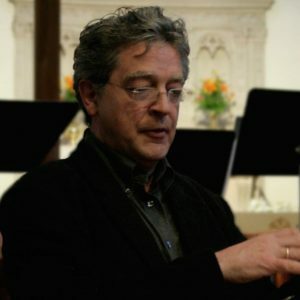 Peter Becker (Bass-Baritone/Aeneas) has performed throughout the USA, Europe, Asia, and South America in repertoire ranging from medieval to contemporary. Theater credits include performances with the New York Shakespeare Festival, Glimmerglass Opera, and the 21st Century Consort. Guest appearances include those with Tafelmusik, Smithsonian Chamber Players, Magnificat, the Newberry Consort, Folger Consort, Portland Baroque, Artek, and has performed at a number of festivals including Spoleto (Italy and USA), Caramoor, Ravinia, Aldeburgh, Utrecht, Hong Kong, Ravenna, Jerusalem, Macao, Miyazaki, and Saratoga. 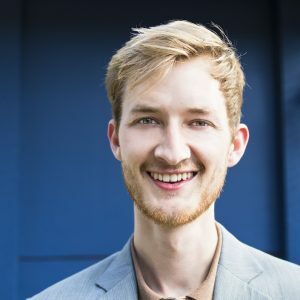 As a member of the male vocal quintet Hudson Shad, he has performed with such distinguished conductors as Kurt Masur (New York Philharmonic), Zubin Mehta (Los Angeles Philharmonic), Michael Tilson Thomas (San Francisco Symphony), Charles Dutoit (Philadelphia Orchestra), and Bruno Bartoletti (Orchestra Regionale Toscana). Contemporary music credits include Tan Dun’s Marco Polo, Peter Maxwell Davies’ Eight Songs for a Mad King, Heinz Karl Gruber’s Frankenstein, William Walton’s Façade, Stravinsky’s Renard, Oliver Knussen’s Where the Wild Things Are, Mark Kuss’ The Show, and Kurt Weill’s Seven Deadly Sins. EMILY NOËL (Soprano/Belinda), praised for her “sparkling performances” and “sheer vocal beauty” by The Washington Post, concertizes throughout North America and Europe in a wide variety of repertory expanding from the Medieval to the contemporary. 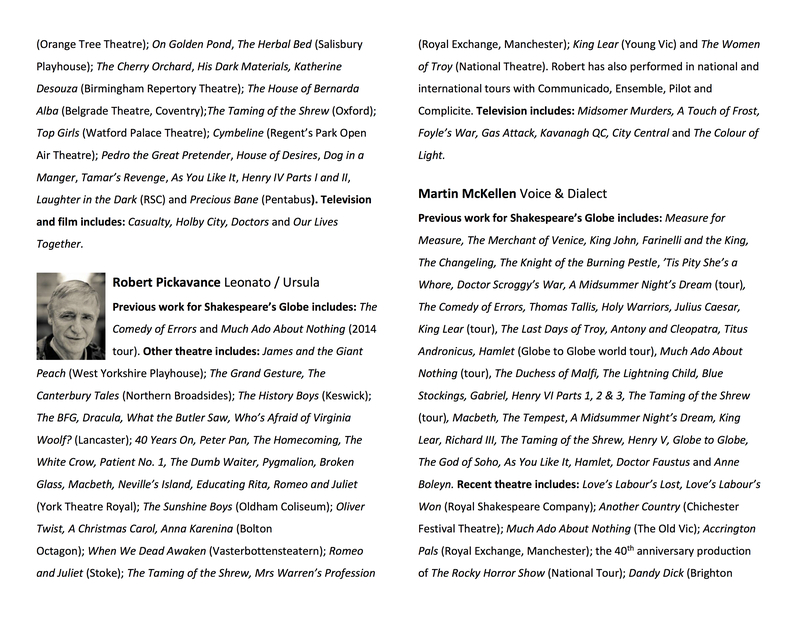 Highlights of the 2014-2015 season include a production of The Merchant of Venice with Sir Derek Jacobi and the Gabrieli Consort at Shakespeare’s Globe Theatre; a staged adaptation of Purcell’s The Witch of Endor at the Washington National Cathedral; Bach’s Mass in B Minor with the Washington Bach Consort; Handel’s Dixit Dominus with the Handel Choir of Baltimore; Bach’s Psalm 51 with the Norfolk Chamber Consort; and CPE Bach’s Magnificat at the 2014 American Bach Society Biannual Meeting. In recent reasons Ms. Noël has appeared as a soloist in Bach’sMatthäus-Passion at the Washington National Cathedral, George Crumb’s Apparition and Ancient Voices of Childrenwith Indiana University’s New Music Ensemble, Monteverdi’sVespers with The Orchestra of the 17th Century, and selections from Guglielmi’s Debora e Sisara at the Italian Embassy as part of the 2013 Anno Della Cultura Italiana. An avid chamber musician and choral singer, Ms. Noël has collaborated with the American Classical Orchestra, Santa Fe Desert Chorale, Tiffany Consort, Raven Consort, Spire Chamber Ensemble, Skylark Vocal Ensemble, Cathedra, and The District Eight; and has appeared at the Santa Fe Chamber Music Festival, Dumbarton Concert Series, Shandelee Music Festival, Peabody at Homewood Recital Series, and Indiana University New Frontiers Program. Ms. Noël can be heard on A New Song: Celebrating the King James Bible and Christmas in New Spain with The Folger Consort on the Bard label. She has also sung for multiple recordings on the Dorian Label, including Passion & Lament: Choral Masterworks of the 17th Century; Johann Sebastian Bach: Motets; and Handel’s Alexander’s Feast. 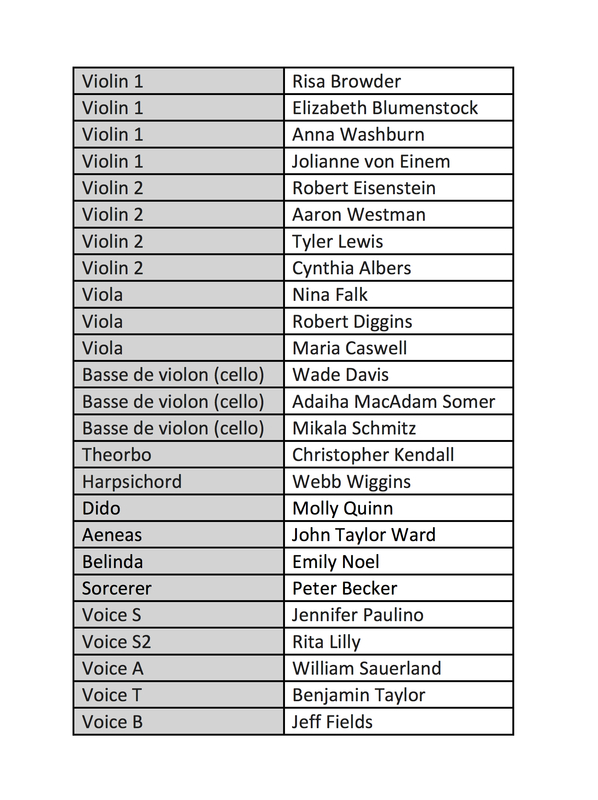 Ms. Noël’s radio broadcasts include solo performances on Washington DC’s classical station, WETA, and Baltimore’s public radio station, WYPR. A native of Washington, D.C., Ms. Noël earned her Master of Music in voice from Peabody Conservatory and her Bachelor of Music from the University of Maryland, College Park. Ms. Noël is an assistant professor of voice at The Community College of Rhode Island. 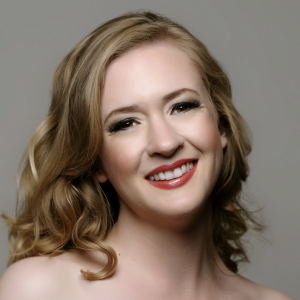 Molly Quinn (Soprano, Dido) has captivated audiences with her “radiant” soprano, possessing an “arresting sweetness and simplicity” (NY Times) in diverse repertoire ranging from Monteverdi to the Rolling Stones. Ms. Quinn opened her 2013/14 season as one of four Virginia Best Adams Fellows at the Carmel Bach Festival, highlighting her penchant for 17th and 18th century music in performances of Bach, Buxtehude, Handel and Purcell. She continued with performances as the soprano soloist in the world premiere completion of Mozart’s Requiem by composer Gregory Spears with Miami’s GRAMMY® nominated Seraphic Fire, Handel’s Messiah at Alice Tully Hall with Trinity Choir and Baroque Orchestra and In Dulci Jubilo, a collaboration between TENET, Bach Collegium San Diego and Dark Horse Consort in the music of Michael Praetorius in both New York and San Diego. 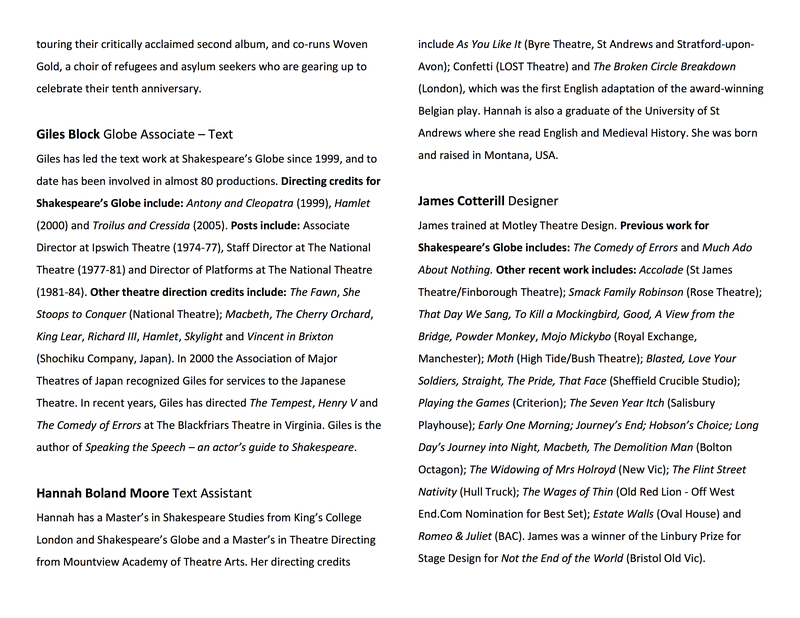 As a member of New York’s TENET, Ms. Quinn has been a long-time collaborator of artistic director Jolle Greenleaf. She has been featured in several projects, including the Green Mountain Project, the TENEbrae series and their duo program Uno + One: Italia Nostra, recorded and released this fall by Avie Records to critical acclaim and dubbed as an “Album of the Week” by WQXR. TENET proas well as touring the program to Costa Rica, Puerto Rico and forthcoming appearances in Denmark this summer. Since 2006, Molly has been a member of the renowned Trinity Wall Street Choir, performing regularly at services, the Bach at One series, concert programs, recordings, and tours. She is a featured soloist on their 2013 GRAMMY® nominated recording of Handel’s Israel in Egypt with conductor Julian Wachner on the Musica Omnia label, has appeared with them in London, Moscow, Paris, and Sonoma, and joined soprano colleagues in singing back up for rock legends The Rolling Stones at The Barclays Center. In recent seasons, Ms. Quinn has appeared regularly with notable early music ensembles and festivals including Clarion Music Society, The New York Early Music Festival, Antioch Chamber Ensemble, Connecticut Early Music Festival, Ecstatic Music Festival, Mostly Mozart Festival, Quicksilver, and Seraphic Fire. As a proud native of Chapel Hill, North Carolina, Molly is drawn to the root music of Appalachia and Ireland and has performed in the cross-over programs Come to the River with Apollo’s Fire and The Music of Dublin with The Folger Consort. Upcoming performances include Arvo Pärt’s Passio with TENET at Carnegie Hall as part of the collected stories series curated by composer David Lang, Monteverdi’s Vespro della Beata Vergine 1610 with Cambridge Concentus and conductor Joshua Rifkin, as well as on tour in the U.S. with Apollo’s Fire and conductor Jeannette Sorrell, and a return home to Chapel Hill, NC for both Mozart’s Regina Coeli at the University of North Carolina in the newly restored Memorial Hall and a program of French cantatas for the newly launched HIP [Historically Informed Performance] Festival. Ms. Quinn holds both the Bachelor of Music and Master of Music in Vocal Performance from University of Cincinnati-College Conservatory of Music and currently resides in New York City. The “dynamic young baritone” John Taylor Ward (Alex Ross, The New Yorker), has been praised for his “impressive clarity and color,” “velvety suaveness” (New York Times), “Stylish Abandon” (The New Yorker), “lovely, firm bass” (Opera Britannia), and “finely calibrated precision and heart-rending expressivity” (Washington Post). This season, he has appeared as a principal artist on five continents, joining ensembles such as Les Arts Florissants (as a laureate of the Jardin des voix), Collegium Vocale Ghent, the Boston Camerata, and the Grammy-winning chamber ensemble Roomful of Teeth. Other recent credits include several roles in the Boston Early Music Festival’s cycle of Monteverdi operas, the premiere staging of Orfeo Chaman with the ensemble L’arpeggiata, performances of Viver’s Copernicus and Saariaho’s La Passion de Simon under the direction of Peter Sellars, and an upcoming world tour of Monteverdi’s operas under the direction of Sir John Elliott Gardiner. Originally from Boone, NC (USA), Taylor is a graduate of the Eastman School of Music and holds two advanced degrees from Yale University. He is a recipient of the Margot Fassler Award for Excellence in Research and Performance (2012), the Yale School of Music Alumni Prize (2013), the Harriet Hale Wooley Scholarship for American Artists in Paris (2013), the Carmel Bach Festival’s Virginia Best Adams Fellowship (2014), and the Helpman Award for Best Classical Chamber Music Performance (Australia, 2015). He is the co-founder and associate artistic director of the Lakes Area Music Festival (Brainerd, MN) as well as a founding core member of Cantata Profana, which was recognized with Chamber Music America’s 2015 award for Most Adventurous Programming. is one of Fiasco Theater’s co-artistic directors and founders. Broadway: The Importance of Being Earnest, Lend Me a Tenor. Off-Broadway: Fiasco’s Cymbeline, The Marriage of Bette and Boo. Regional favorites include Fiasco Theater’s Into the Woods, McCarter Theatre; Jane Eyre, Guthrie Theater; Is He Dead?, Pioneer Theatre; The Mystery of Edwin Drood, Trinity Repertory Co; My Fair Lady, Actors Theatre of Louisville and Virginia Stage Company; and Cabaret & Main, Williamstown. Adjunct faculty at NYU’s Gallatin School. Proud graduate of Brown University and the Brown/Trinity M.F.A. Acting Program. 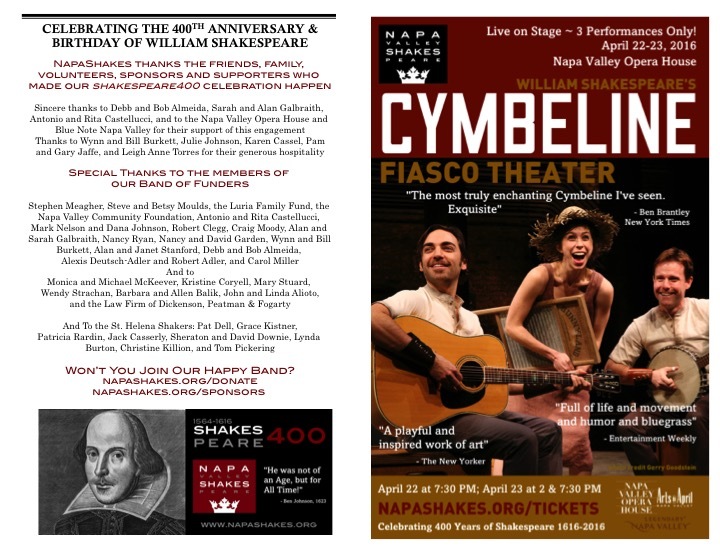 Off Broadway: Fiasco’s CymbelineTFANA/Barrow Street Theatre; The Taming of the Shrew, TFANA. Regional: Fiasco’s Into the Woods, McCarter Theatre; various shows with Trinity Repertory Co., Pig Iron Theatre Co., The Vineyard Playhouse, Company of Fools, The Theater at Monmouth, BoarsHead Theater, The Peterborough Players, Berkshire Theatre Festival. Training: M.F.A. from the Brown/Trinity Graduate Acting Program where he was a Stephen Sondheim Fellow. 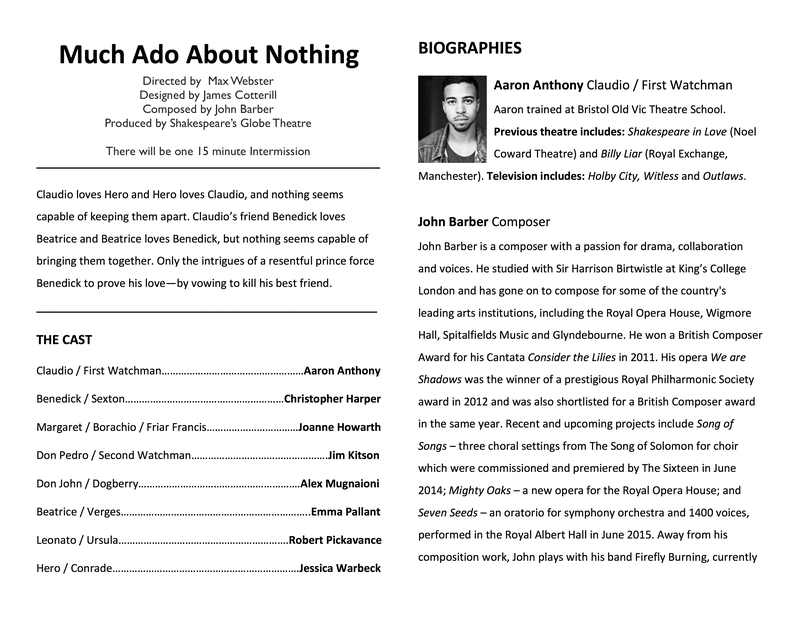 has appeared is Fiasco’s Cymbeline, TFANA/Barrow Street Theatre, Into the Woods, McCarter Theatre, and Twelfth Night. Broadway: Cyrano de Bergerac. 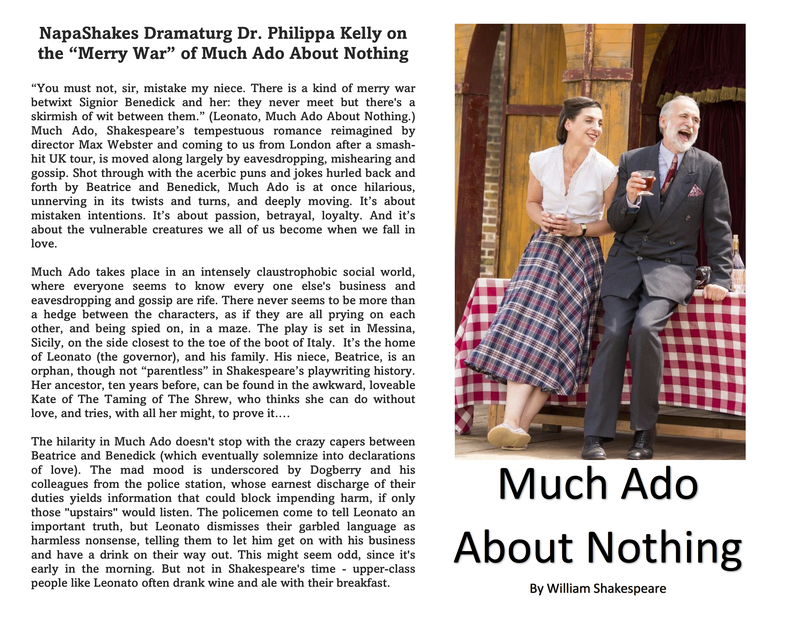 Off Broadway: Petruchio in Taming of the Shrew, TFANA; Henry V, The Acting Company. Regional: The Heart of Robin Hood, A.R.T. 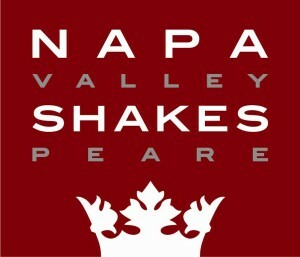 ; Noises Off, Actors Theater of Louisville; Servant of Two Masters, Yale Rep/Shakespeare Theatre; Mrs. Smith Presents…, A.R.T. 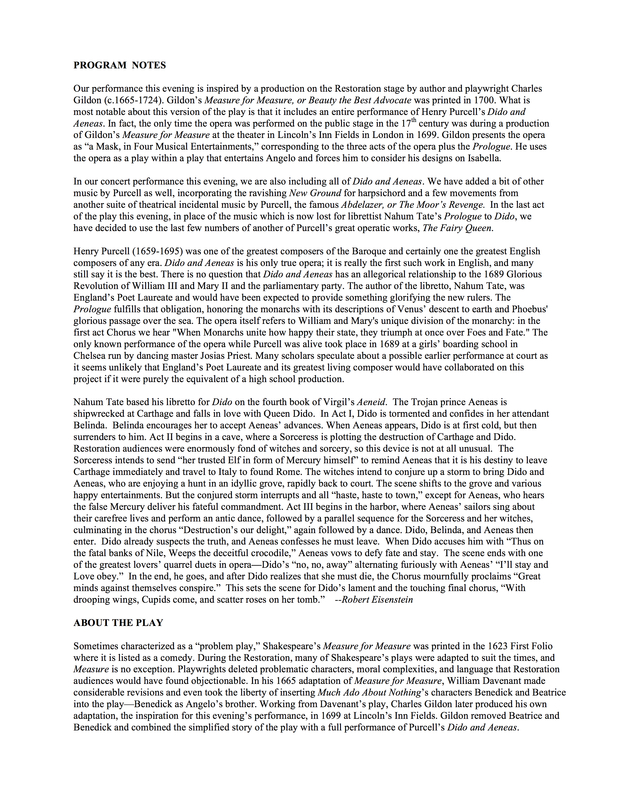 ; The Moliere Impromptu, Moon for the Misbegotten, Trinity Rep; Ivanov, Lake Lucille Chekhov; Broad Stage; Guthrie; Arizona Theatre Company; Sundance Theatre Labs among others. Additional NYC: Balm in Gilead (with Michael Shannon), Monstrosity, 13P; The Scariest, The Exchange. Film: Still on the Road for PBS and American Gladiators. TV: Elementary. 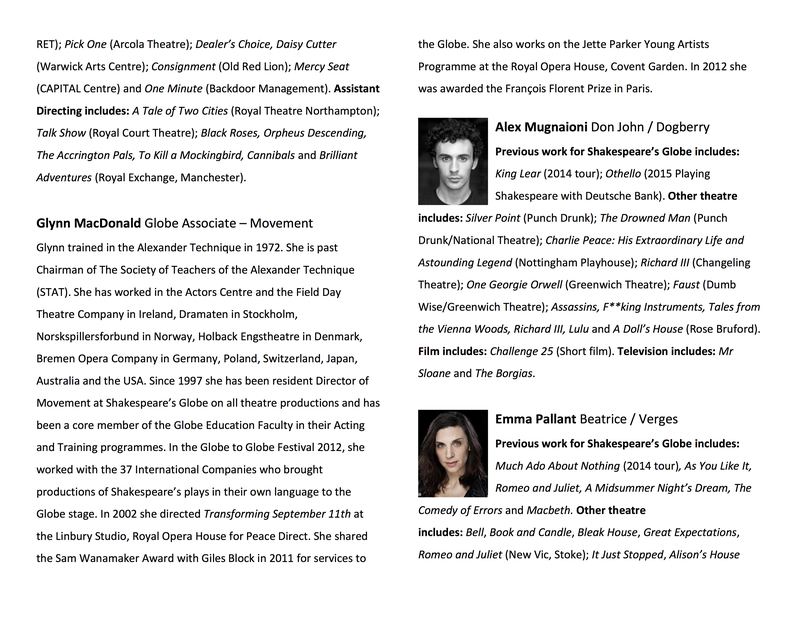 Andy is a graduate of the Brown/Trinity Rep. MFA Brown/Trinity, Ecole Phillipe Gaulier. Apprentice to Chris Bayes, and he’s from Iowa. is an actor, director, teacher and musician. He is Co-artistic director and Head of Artistic Development for Fiasco Theater. Ben has co-directed and acted in Fiasco’s productions of Cymbeline, Into the Woods, Measure for Measure, and Twelfth Night. He co-directed The Two Gentlemen of Verona. He has been seen on Broadway in Cyrano de Bergerac and Bloody Bloody Andrew Jackson. 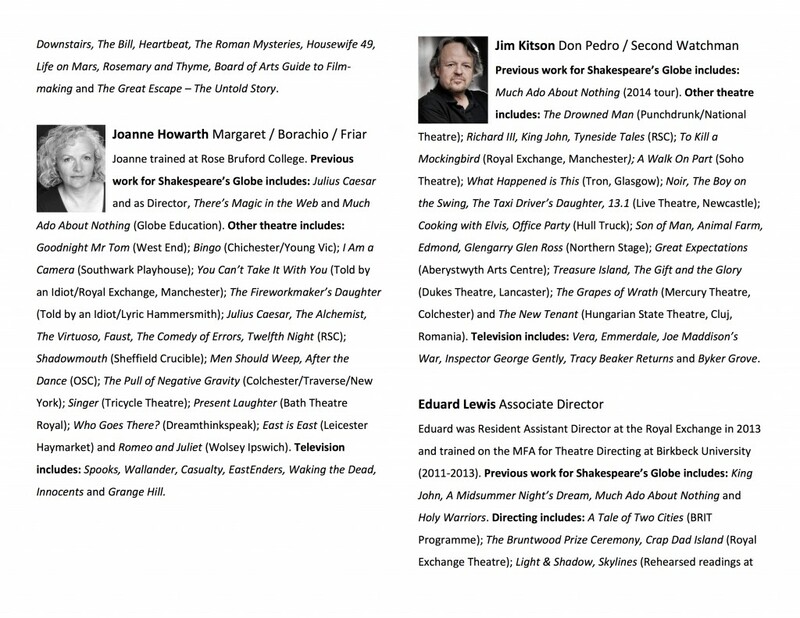 Off-Broadway work includes: Barrow Street Theatre, TFANA, The Public Theater. Regional acting credits include: McCarter Theatre, Old Globe, Center Theatre Group, Westport Country Playhouse, Portland Center Stage, Williamstown Theatre Festival, and ten plays with Trinity Repertory Company. Ben’s television work includes “The Good Wife,” “Law & Order: Criminal Intent” and “Late Night with Jimmy Fallon”. He was recently featured opposite Christopher Plummer and Benjamin Walker in the HBO film Muhammad Ali’s Greatest Fight. Ben is an adjunct professor at NYU’s Gallatin School of Individualized Study. He has narrated several Young People’s concerts as an artist-in-residence with the New Jersey Symphony Orchestra. Ben is a graduate of Brown University (B.A. 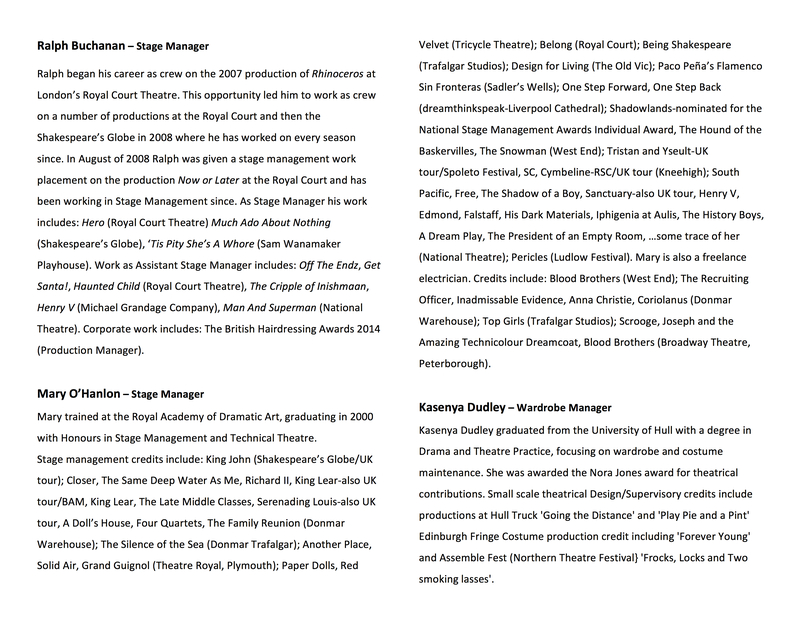 ), and the Brown/Trinity MFA Acting Program. Broadway: Bloody Bloody Andrew Jackson. Off- Broadway: Fiasco’s Measure for Measure, New Victory Theater, Cymbeline, TFANA/Barrow Street Theater; Bloody Bloody Andrew Jackson, Public Theater; Romeo and Juliet,Theater Breaking Through Barriers; ColoradoSPF ‘04. 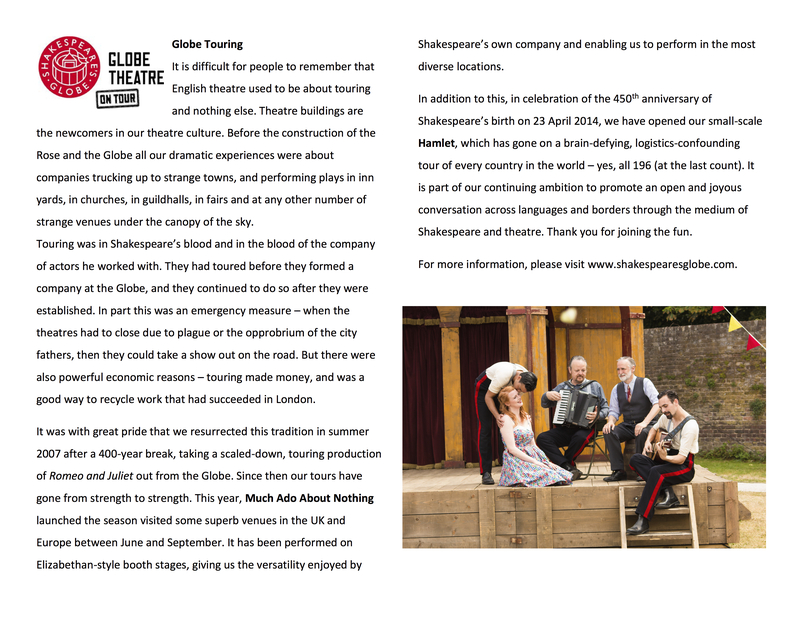 Regional: Into the Woods, Old Globe; King Lear, Much Ado About Nothing, North Carolina Shakespeare Festival; Love’s Labour’s Lost, Much Ado About Nothing, Henry V, Illinois Shakespeare Festival; Cherry Orchard, Trinity Rep; Emma, Kennedy Center’s Millennium Festival. Workshops/readings: New York Stage and Film, Sundance Theater Lab; Film: God of Love, Academy Award for Best Live-Action Short 2011, Manhattan Melody (Telluride, Woodstock, Atlanta), Natives, SXSW. Training: MFA – Brown University/Trinity Rep; BA – Brown University. FIASCO THEATER is an ensemble theater company created by graduates of the Brown University/Trinity Rep M.F.A. acting program. 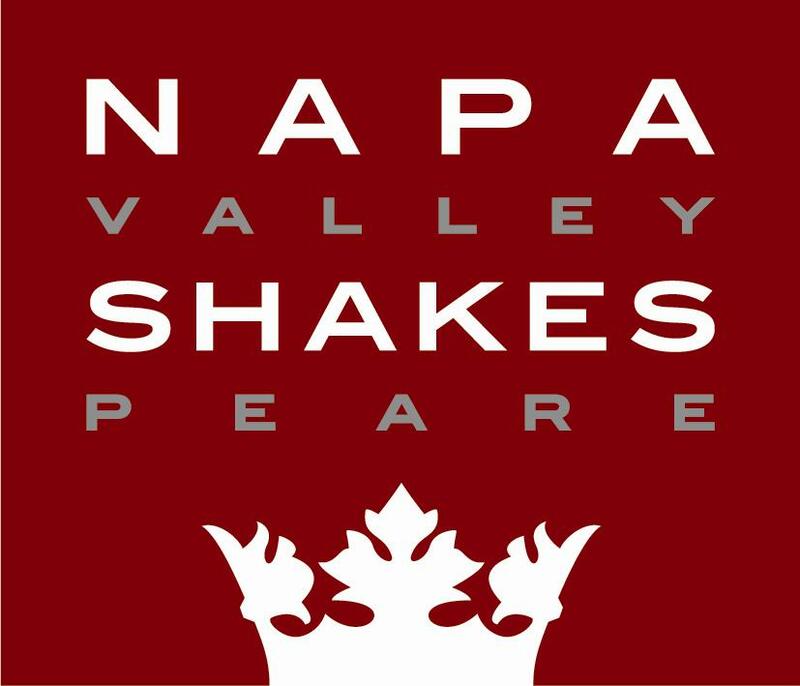 Past shows include Cymbeline(TFANA/Barrow Street), Into the Woods (Roundabout, Old Globe, McCarter), Measure for Measure (New Victory), The Two Gentlemen of Verona (Folger/TFANA) and Twelfth Night. 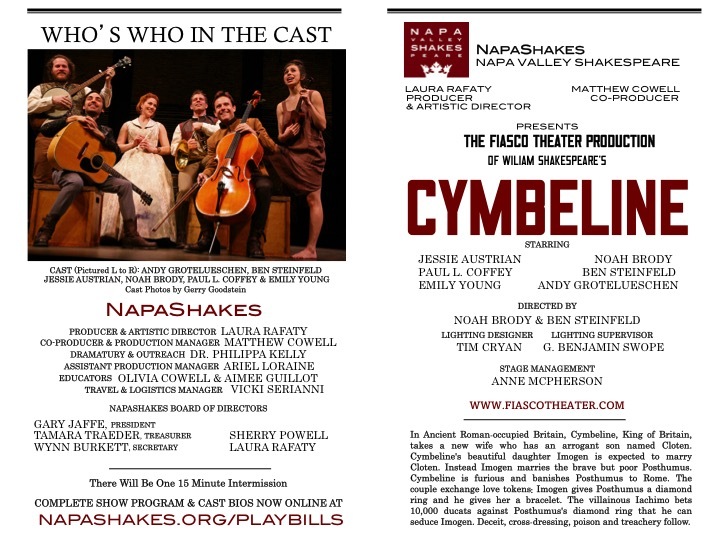 Cymbeline was presented Off-Broadway twice, for nearly 200 performances, and was honored with the 2012 Off-Broadway Alliance Award for best revival. Into the Woods garnered the 2015 Lucille Lortel Award for Best Revival. Every year, Fiasco offers the Free Training Initiative—a three-week, conservatory-level classical acting intensive for professional actors, completely free of charge to students. Fiasco has been in residence with Duke University, Marquette University, LSU, and NYU-Gallatin. Their work has been developed at the Sundance Theatre Lab, the Orchard Project, SPACE at Ryder Farm (upcoming) and the Shakespeare Society, and Fiasco has led master classes at Brown University and NYU.